Three kinds of kale arrived at my doorstep, together with a bag of arugula, and two kinds of parsley. A Birthday cornucopia from an unknown well-wisher! I set to washing, and prepping, and with the flat leaf (Russian) kale made a saute with oyster mushrooms, cumin, turmeric, and salt. Later in the week, I will add wheat berries and other grains to create a pilaf, and spice it up with chili pepper and curry leaf. Three kinds of kale and no one to take credit! 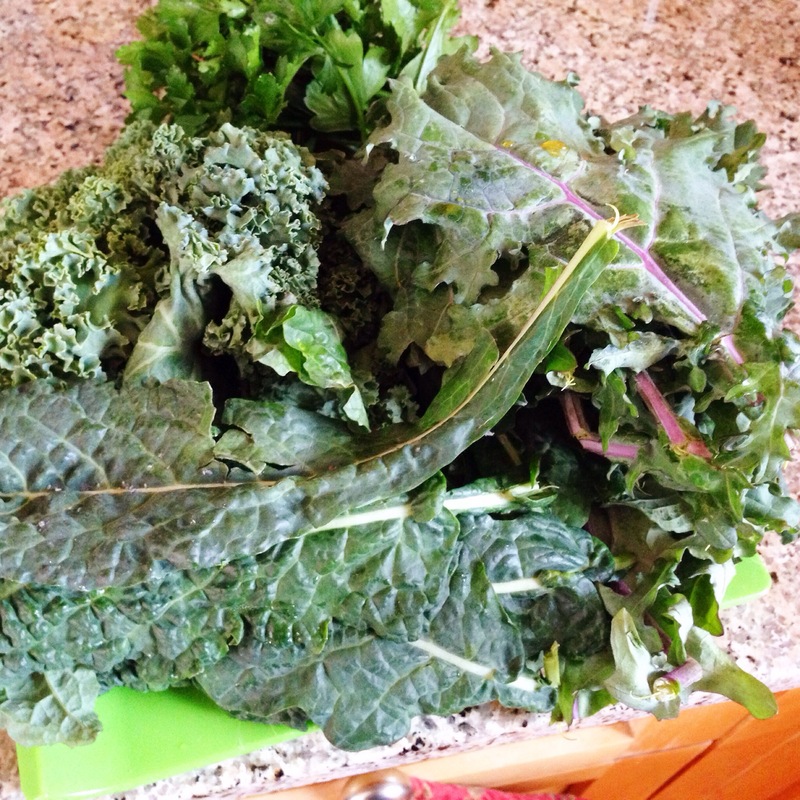 Lacinto, known as dinosaur, curly kale, and the aforementioned. From this website, in addition to learning that eating steamed kale helps lower cholesterol, I found a recipe for braised apples and kale, drizzled with balsamic vinegar. Is Kale the New Prozac? asks this website, an article worth reading for the title alone, and the mention of a Harvard journal called Psychosomatic Medicine, which seems an oxymoron at the very least. Yet I admit I am happy to believe that kale can lead to optimism. Three kinds of Kale and parsley, so a kaling we will go then into this new year! And Thank You, Mysterious Bringer of Greens! Thanks for remembering Jaishree’s Birthday. Saw the kale post, did we miss yours ? Sillies, you sent an ecard! Five days before J’s. Oh, Badri, Rosie always remembered, i just remembered. Love to today’s birthday girl! A beautiful green bouquet! Cheers to your health November sister.